We're here to help our customers get the most from their musical journey by providing the highest quality and selection of Native American inspired Flutes and Flute Accessories. As you visit us here at the Oregon Flute Store, you'll discover that we offer a large selection in... Native American Style Flutes, Protective Flute and Drum Carrying Cases, Native American Flute History Resources, Bird Whistles/Calls, Native American Flute Stands, Music CD's, Combination Flute Packages, Painted and Beaded Leather Flute Wraps, Microphones, Flute Jewelry, How to Make a Native American Flute Instructional Books and Videos, How to Play the Native American Flute Instructional Books and Videos .... and more!! Not sure where to start? We can answer your questions about beginning flute playing and have beginning flute packages to help! Thanks JoAnn! We continue to be amazed at your level of customer service - it is second to none in the industry! We offer flutes crafted by several flute makers. Some are Native; Some are not. We do not claim to be affiliated with a Native American Tribe. 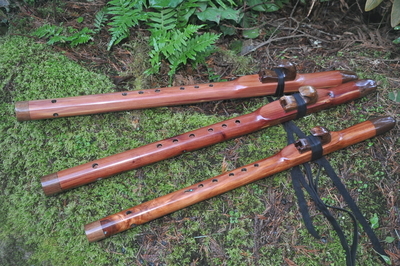 Some of our flutes are considered to be Native American Style Flutes. Not all our instruments and accessories are being made by tribal recognized Native American Indians. We will indicate in the product description if the item is Native made. Please visit The Indian Arts and Crafts Act of 1990 for more information on this issue.